BFOC and O.C. Film Festival Polaroid Bike Ride! PhotoVelo Bicycle Scavenger Hunt | Free! Prizes! Come out for the Cyclesomatic block party THIS SATURDAY NIGHT in Bishop Arts District. 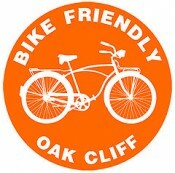 Oak Cliff Bicycle Company will be celebrating the grand opening of its new location (across the street from Eno’s) with an alley cat race at 5 pm, plus Lonestar Goldsprints, a bike-in movie, music, food, beer, and more throughout the night.